Q: A pair of US B-1B strategic bombers departed from the US Air Force Base in Guam on May 1 and reached the airspace above waters to the east of the ROK at noon for joint exercises with the ROK air force. The DPRK said that the bombers conducted a nuclear bomb dropping drill against major objects in its territory, adding that the reckless military provocation is pushing the situation on the Korean Peninsula closer to the brink of nuclear war. What is China's comment on that? A: We have noted the ongoing military drills. The current situation on the Korean Peninsula is highly delicate and complex. 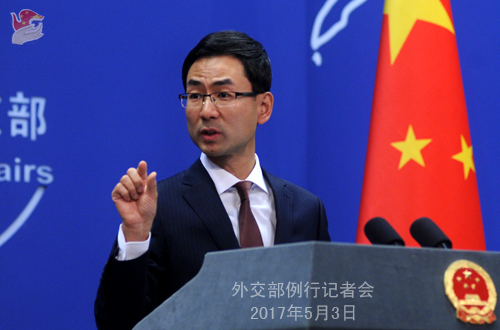 The Chinese side is opposed to actions or remarks by any party that may inflame the situation and jeopardize regional peace and stability. What is imperative is to cool down the situation and restart dialogue and consultation. We once again urge all relevant parties to keep calm and exercise restraint, stop provoking each other, strive to create the atmosphere for contact and dialogue and return to the right track of dialogue and negotiation at an early date. Q: It is reported that US Secretary of State Tillerson is going to host ASEAN foreign ministers in Washington on May 4. The issue of the South China Sea, especially China's sovereignty claim will presumably be one of their topics. What is China's comment on that? A: The issue of the South China Sea is an issue between China and some of the ASEAN countries, rather than between China and the entire ASEAN or between China and the US, still less between the US and ASEAN. Working together, China and ASEAN countries have stabilized and improved the situation in the South China Sea. All parties should cherish and preserve this hard-won result. 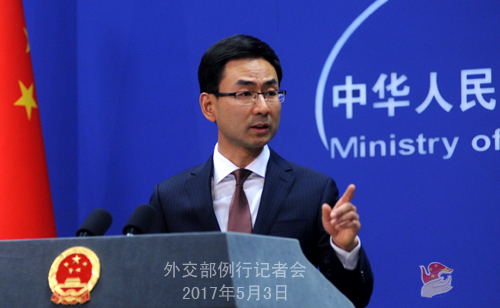 We also hope that relevant countries outside the region will respect joint efforts by countries within the region to maintain peace and stability in the South China Sea. Q: Diplomats of the United Nations say that the US is negotiating with China over stronger actions against the DPRK, including possibly new sanctions. Can you give us more details? A: There was thorough and in-depth discussion on the current situation of the Korean Peninsula at last week's open ministerial meeting of the UN Security Council on the Korean nuclear issue. Most of the Security Council members put stress on both nuclear non-proliferation and peace talks. We maintain that dialogue and consultation is the only viable and right choice to peacefully resolve the nuclear issue on the Korean Peninsula. What is pressing now is that all parties resume contact and dialogue at an early date. As for the so-called new sanctions, the question "would the Security Council adopt new sanctions if the DPRK conducted another missile launch or nuclear test" is a hypothetical one, and I will make no comment on that. But one thing is for sure: Resolution 2321 of the Security Council stated the determination of the Security Council to take further measures in the event of a further DPRK nuclear test or launch. I cannot remember the exact language. You may look it up in the resolution. Q: Is it true that the Chinese Embassy in the DPRK two weeks ago advised Chinese citizens living in the DPRK to leave the country? A: It is fake news according to what we have learnt. The Chinese Embassy in the DPRK has never issued any such kind of notice. China and the DPRK are close neighbors with normal people-to-people exchanges. There are Chinese citizens entering and exiting the DPRK every day, and that is quite normal. Q: It is reported that the high-level meeting on Syria will be held in Astana on May 3 and 4. 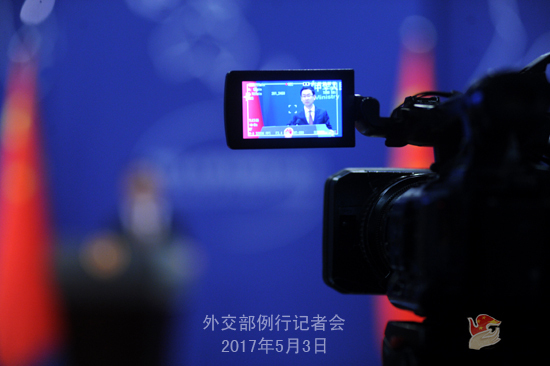 Given that parties are still divided on the issue of Syria, what is China's expectation for the meeting? A: Serving as a useful complement to the Geneva peace talks, the Astana talks aim at providing guarantee for the ceasefire in Syria. The Chinese side believes that the crisis in Syria can only be defused through political means. We hope that all relevant parties of the international community will enhance communication and show their good faith at the talks so as to build up mutual trust, lay the groundwork for substantive progress in future Geneva peace talks, and drive forward the process of politically resolving the Syrian issue. Q: You just mentioned Resolution 2321. Are you saying that within the existing framework at the Security Council, there is the potential for more sanctions? A: I suggest that you read through Resolution 2321 for the accurate wording. Q: Some experts have recently voiced their concerns that further nuclear tests in the DPRK might potentially trigger a volcanic eruption in Changbai Mountain on the border between the DPRK and China. Do you have any comment on that? Is China also concerned about that? A: That opinion sounds frightening. I am wondering whether it is based on scientific grounds. If you are interested, I'd refer you to the specialized department for a professional response. What I would like to say is that the Chinese side stays committed to realizing denuclearization on the Korean Peninsula, upholding peace and stability of the Peninsula, and resolving the relevant issue through dialogue and consultation. We have been stressing that Security Council resolutions prohibit nuclear activities by the DPRK. Q: The Kimberley Process (KP) intersessional meeting was held in Perth, Australia on May 1. According to the Australian media, tension rose at the meeting because there was a delegation invited from Taiwan. It is also said that the Australian Department of Foreign Affairs raised this issue with the Chinese ambassador. Can you tell us anything about the Chinese government's perspective on this, and what possibly the ambassador had to say to the Australian side about this matter? A: Our position on Taiwan's participation in activities of international organizations is clear and consistent, and that is to follow the one-China principle. The understanding was reached between China and the KP in 2003 when the process was inaugurated that Taiwan provisionally executes the Kimberley Process Certification Scheme (KPCS) in the name of the rough diamond-trading entity of Chinese Taipei. However, Taiwan is neither the participant nor observer of KP, and shall not attend meetings of its working groups or committees. Before the intersessional meeting, the host unilaterally decided to invite Taiwan to attend as a "guest" of the Chair, which violated relevant rules of the process. 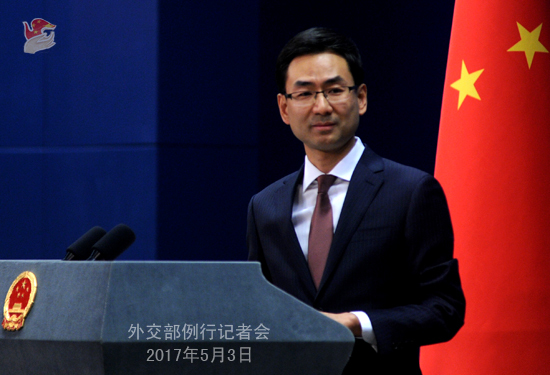 The Chinese side lodged repeated representations with the host before the meeting, but China's reasonable concerns were not respected. Most KP participants and its committees and working groups also clearly voiced their disapproval of the host's practice. It is confusing and regrettable that the host was completely indifferent and held on to its own view. China's expression of concerns about the issue and relevant arrangements at the meeting was in line with the rules of procedure and was perfectly reasonable and fair. China's position and concerns were also echoed and supported by many other participants at the meeting. Q: Japanese Prime Minister Shinzo Abe said today that as head of the ruling Liberal Democratic Party, he plans to revise the Constitution and put it into force in 2020, making sure that the revision will make explicit the existence of the Self-Defense Forces. What is China's comment on that? A: Due to the reason of history, the issue of Japan revising its pacifist constitution has long been the concern of its Asian neighbors. We hope that Japan will earnestly draw lessons from history, follow the trend of the times, stick to the path of peaceful development and play a constructive role in safeguarding regional peace and stability. Q: The Green Peace says that three African countries, Guinea, Guinea-Bissau and Sierra Leone, have recently detained eight Chinese fishing boats off their coasts and accused them of illegally fishing. Do you have any information on this case? A: We have noted the situation. The Chinese government opposes all forms of illegal fishing and requires Chinese-funded fishing companies to conduct business in accordance with laws and regulations and protect marine environment. We also hope that relevant countries will enforce the law properly, deal with the matter according to the law and protect the lawful rights and interests of Chinese companies and citizens involved. Q: The US nominee for ambassador to China Terry Branstad said during his confirmation hearing that there might be room for secondary sanctions against Chinese companies in order to enforce sanctions against the DPRK. Do you have any comment on this? A: First, as a permanent member of the Security Council, China has been fully, accurately, strictly and faithfully implementing the Security Council's resolutions on the DPRK and fulfilling our international obligations. Second, the Chinese side always opposes any country's imposition of unilateral sanctions on others based on its own domestic law, and opposes the damage such measures can cause to China's interests.